This old Viking port is your gateway to the scenic wonders of the Geirangerfjord district. Offering stunning vistas of mountains, waterfalls and ferocious white water rivers teeming with salmon. 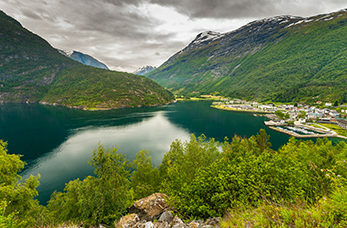 Considered by many to be the most beautiful fjord in the world, Geirangerford and its landscape is included on UNESCO's list of World Heritage Sites. Offering an impressive view over Geiranger and GeirangerFjorden, Flydalsjuvet is one of the most photographed sights in Norway. The largest glacier on mainland Europe is surrounded by Jostedalsbreen National Park, covering about 310 square miles of the park. Make sure you visit one of the world's finest views offering breathtaking views of the Geirangerfjord, the mountains summit is 4,757 feet above sea level. This famous glacier arm is one of the best known arms of the Jostedalsbreen Glacier, marvel at this glacier and its mighty mountains that surround it. Videfossen Waterfall (also known as Buldrefossen waterfall) here you can witness the thunderous Waterfall as it dives to the valley below.